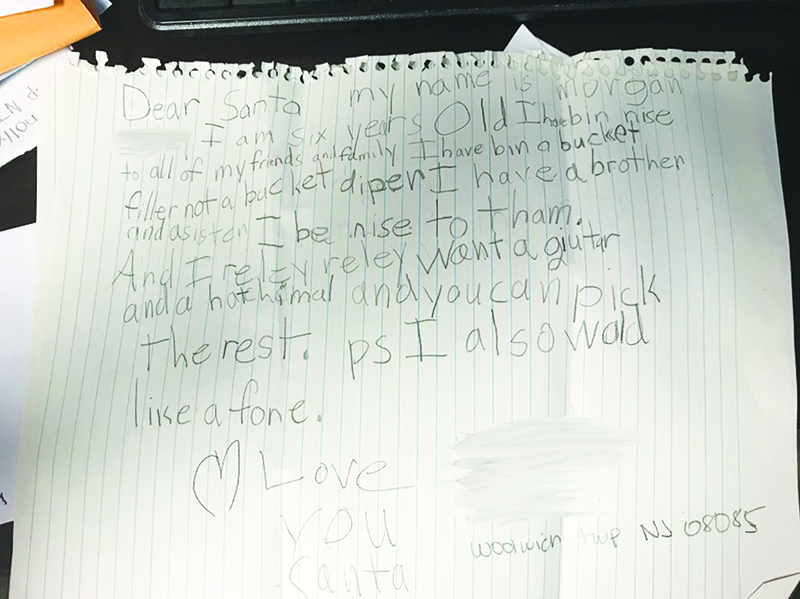 A six-year-old “reley reley” wants a guitar and a phone. Reley. It was the Legos. Those colorful, cleverly interlocking blocks of plastic were on Dominick Spina’s mind three years ago, when he was six and just exploring a knack for building stuff. But for Dominick’s twin sister, Francesca, and their older sister, Allie, eight, the must-have toy was those cute, mysterious eggs you nurture until they crack open their shell and hatch. Hatchimals was the toy Allie and Francesca yearned for at Christmas 2015. Imagine the excitement when the twins and Allie, children of Sandi and Michael Spina of Woolwich, spotted a red mailbox at NFM Lending Co.’s office porch on Kings Highway in Swedesboro. It was not just any mailbox. It was a mail drop for letters directly to SANTA. Yes, that Santa. The jolly, kind-hearted fellow from the North Pole who keeps a list of the good, and the sometimes naughty, boys and girls, and who loves to surprise them with gifts under the Christmas tree. “We happened by and saw the big red mailbox and the kids were so excited. They wanted to send a letter to Santa,” remembered Sandi Spina. “They each wrote a letter and we came back and mailed it and they were very excited to get a letter back,” she said. So how did a mail drop for Santa letters end up in Swedesboro? And by what magic did the Spina children receive a reply? While considering ideas for a community project, Cook and Lex saw a standing mailbox for sale online, quite by chance. Or, is it possible, by a chance encounter with a wish from Santa to hear from area children? While there’s no way to know why this mailbox became available just as the co-managers at NFM were looking, it was unmistakable what the item was, Cook said. “It looked just like a North Pole mailbox. It was red and old-fashioned and you could see it was North Pole right away,” he said, happily. But the mailbox does more, as local advertising about the project makes clear. Every letter to Santa will be answered. There will be a reply, but not like the form letters sent when a child writes in response to an ad online or in a magazine and for which a parent has paid a fee. The Santa mailbox letters are answered for free and by a Santa elf who carefully considers how important the letter to Santa is. How do we know this? One of the elves told us. Co-managers Jerry (Cook) and Bill (Lex) knew right off that the letters from children to Santa were popular and they looked for the right folks who would pen replies on a volunteer basis. Naturally, the folks he found were Santa’s elves. We got to speak with one of them, Elf Elaine. Not surprisingly for a Santa elf who is close to the Swedesboro community, Elaine said she has also been involved with area Cub Scouts and a nearby church’s annual Trunk or Treat event. Co-managers Cook and Lex, and Elf Elaine talked a bit about the kinds of letters Santa receives from this local mailbox. “Pretty much, as soon as my wife and I get the mailbox out and show it on Facebook, we start getting letters,” Cook said. This same child had further questions, one of which seems to imply a confusion between something his mother said about shoes with a Jewish tradition that may allude to the Mezuzah, a prayer scroll hung on the door that invites protection for those within. Cook said the letters have become a popular tradition locally, with families bringing children each year and telling neighbors, taking photos, and chatting about the experience on Facebook. He remembered a letter that came with no return address but the family had mentioned the mailbox visit on Facebook. In the three years the mailbox has been open for letters at Christmastime, the number of children sending to Santa has increased from a handful to about 140 last year, Cook said. Some letter writers are very young and just circle their wants on pages from catalogs, Elaine said. Others have a list of high-tech devices that are popular with older children, a wish that has become more frequent, she said. But young or old, “Each response is as personalized as we can make it,” she said of the joint effort between Santa and the elves. If you are planning a letter to Santa, be aware that the mailbox is closed and taken back into storage a week or more before Christmas, so that mail to Santa (and replies to the letters) won’t be sent too late to arrive before Santa begins his journey Christmas Eve across the world. In other words, mail early. The Spina children, among the first to send a letter via the NFM North Pole Santa mailbox, will be sending a letter again this year, their mother said. And yes, their requests to Santa for Legos and Hatchimals were fulfilled, she added. Theirs was a Merry Christmas.